Nothing has the potential to bring change to a relationship like prayer. Prayer can soften our hearts, provide wisdom and patience beyond our ability, and remind us of the pure love and grace we have received from the Lord so that we might extend it to another. In The Circle Maker, Mark Batterson shared the legend from the Jewish Talmud of a man named Honi. He was known as “the circle maker” because of his bold strategy of prayer. In a moment of deep need in the nation of Israel, he drew a circle around himself and publicly began to pray. His prayer was a declaration that he would not leave the circle until God blessed his people again. Honi’s prayer was considered one of the most significant prayers in the history of Israel, the prayer that saved a generation. We need this same bold resolve within marriages today. Marriages are suffering. Many couples are experiencing high levels of hurt and disappointment in their marriage and wish to feel a greater connection with their spouse. Some couples sense that God has a greater purpose for their marriage that seems to be eluding them. Young marriages are desperate for hope and direction to make their commitment last. We know it is a foundation of prayer that offers the hope in marriage. It is time for a prayer revival within marriages. The marriages in your church can be strengthened through prayer. It is through prayer that challenges will be overcome, hurts will be healed, and commitments reestablished. Committing something to prayer is about recognizing God as the one capable to lead and direct. Marriage is a journey unique to each couple. Each couple will endure different story lines, some with more heartbreaks than others. Each individual enters marriage with different hang-ups, some more easy to overcome than others. Every marriage has different ailments. But there is one shared antidote: prayer. Marriage is the union of two imperfect people. Through prayer, they invite the presence of a perfect God. The richness of a marriage will be determined by how frequently and how fervently God is invited into the relationship. Prayer will draw a person into unity with God and, as a result, with one another. Circles are an ancient symbol of commitment without end, and to this day it remains deeply symbolic in a marriage ceremony. In a traditional Jewish wedding ceremony there is a symbolic and intimate moment that is shared between bride and groom. Following her processional down the aisle, the bride begins to circle the groom. Traditionally, the bride circles seven times. This circling is a prayer and a declaration of partnership. It’s a spiritual dance of intention, resolving in a moment to covenant with each other to God. 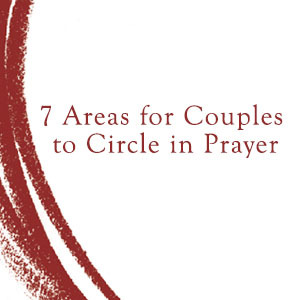 Help the couples in your church learn to grow in love by circling their spouse in prayer. We grew up hearing the same marriage sermon series recycled over and over. But it takes more than just communicating that marriage is important. We’ve got to share what it means to circle our spouse in prayer in different areas. In Praying Circles Around Your Marriage, we offer seven areas for couples to circle in prayer. Vision Circle: How to combine two unique visions for a new and combined purpose together. War Circle: How to understand the roots of conflict and see it as an opportunity for growth and greater connection. Romance Circle: How to avoid the transactional and cultivate a connected and intimate relationship. Dance Circle: How to merge interests, personalities, and histories as a partnership, fluid in movement and motion. How to posture to serve your spouse and position him/her to be used greatly. Support Circle: How to surround your marriage with a healthy support community that will offer encouragement, inspiration, perspective, support, and accountability. Storm Circle: How to build a foundation for your marriage that will help you weather the trials that are sure to come. Legacy Circle: How to leverage your marriage to have influence for generations. Prayer is as important to marriage as anything a couple will ever do. When their knees hit the ground, humility will hit their heart. Let’s re-teach our couples what it means to keep circling! Encourage the married and engaged couples at your church to read the book. Throughout the book, there are prompts for prayer and for action. If a couple stops to pray through each one, they will have prayed twenty-six prayers for their marriage over the course of reading. Those are words that will not fall silent before the Lord. Encourage small groups your church to use this book for study. Consider a sermon series based on the principles in the book.